← HAPPY HOLIDAYS MY BLOGGING FRIENDS ! SAY HELLO TO EMMA: THE SUPER CHICKEN. Look at that sweet face and strong presence. What’s not to love? Before I write this story an apology is due to all of the great bloggers, family, and friends who were loyal to this effort and who I left hanging for so long. To call it a writer’s block would be foolish so here is the truth: I had some health problems that took away the energy necessary for any creative work. The worst of this was the anxiety and depression that followed the physical pain. It is true that your best work only emerges when you are healthy and happy. The fear that I would never again create to that level was paralyzing! Even as I write this I cannot assure you that there will be another story. No details, but please know that I am so grateful for all of your blogs and your attention to mine. All of your comments have been saved and I will answer each and every one in time. Being a part of this community has opened up a whole new world that I never dreamed of entering and because of you I can do more than just paint a pleasing picture. Chapter twelve of I PROMISED YOU CONTINUED is too emotionally charged for now but I will make every effort to write it for you in the future. For the present Emma’s story is something easier to tackle but not without drama because her life in some ways parallels my own and has been at once challenging, tragic, and joyful. Yes, it’s about a chicken and I will write it in chapters because it’s a long story that I hope you will enjoy. Who doesn’t like chickens? Well, I guess some uptight folks! I always thought that they were attractive, resourceful, and fun to watch. So when my kids flew the nest I determined to raise a backyard flock of four. My home sits in the middle of twelve acres surrounded by natural forest and teaming with wildlife so I knew that protecting them from becoming chicken dinner was job one. A secure movable coop and run seemed ideal because they would have tons of pecking room and it could be moved to a new spot every few days. Free range most of the day would have suited me even better but I couldn’t just languish outside keeping an eye on them. First: where to find someone to build their home. Online coops were mostly too small and large ones were outrageously expensive. Craig’s List! I found a farmer’s son who had started a small business building mobile chicken houses. He did not disclose that mine would be his inaugural effort! The price was right and he delivered it about one week later. Whoop’s, no wheels as agreed just a pull rope tied on the front. Now, we are talking about a six-foot guy who could pass for Conan the Barbarian. He easily demonstrated how to pull about two hundred pounds of wood across the lawn and stated that he couldn’t figure out how to attach the wheels! 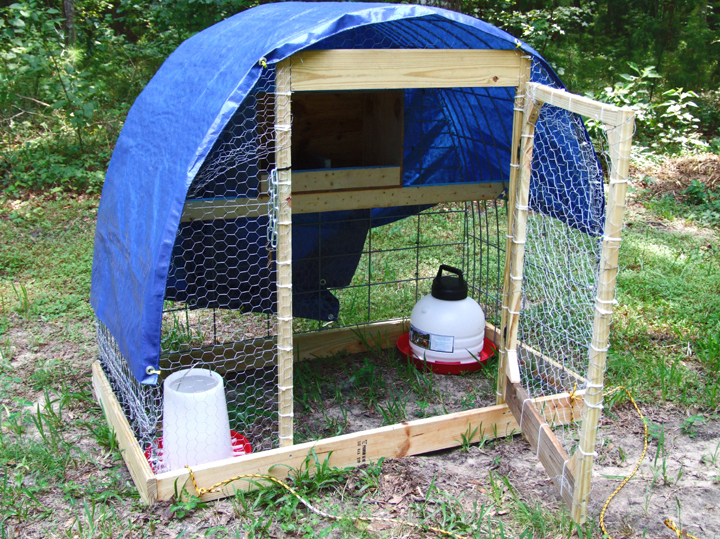 Is this the lamest chicken coop you have ever seen? Depressing! I even had to buy a roosting bar. See the rope that I was supposed to pull? It would have to do for now. Oh well, I was still excited and sat to work figuring out how to move it without a resulting hernia. Finally I noticed that the roosting bar could be placed right through the middle of the cage and extended a good two feet on either side. Flash! I could do this by lifting one side of the bar and then the other, crisscrossing the grass until it arrive in a fresh place. Success! Now I was ready to find my chickens. Art class in my studio was the next day providing a captive audience for my search. One of them was friends with a bird enthusiast who had hundreds of free range chickens and other foul on a sort of bird preserve. Eccentric he was – in a good way -and agreed to sell me four happy girls. No roosters! Thanks. Although he assured me that the hens would not be happy without one. I didn’t buy it! Besides roosters drive you and your neighbors nuts. I had my pick of many breeds but choose four of the same reasoning that they would live together with a minimum of stress. Three were red with some white feathers and one was red with a few black feathers on her tail.This one I named Emma and I knew that she was special from the start. She was a big beautiful girl who right away took her place as head chicken. They were all about five months old and started laying eggs right away. I could tell them apart so names were quickly established. Well, after a few days of observation. All were sweet docile animals following Emma around the yard. However the pecking order did emerge: Emma, Joanna, Harriet, and Billy Jo respectively according to size and (ahem) intelligence. 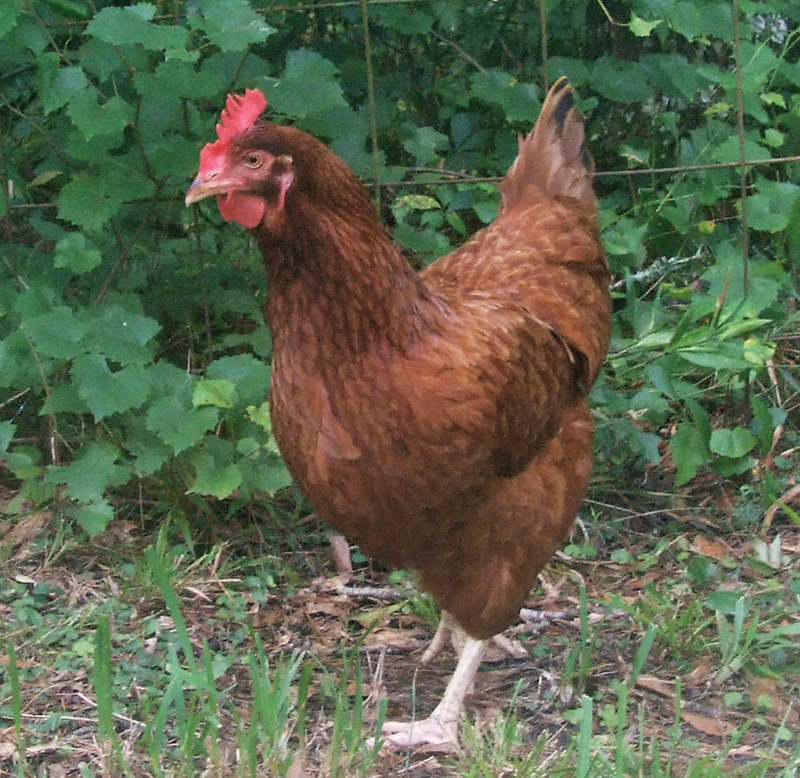 Emma was not merely the head chicken; she was the mother chicken herding all the rest with gentle firmness. They were never far away from her and copied her erect still posture whenever a threat was suspected. Chickens seem to have the idea that if they stand perfectly still big birds overhead cannot see them. They could be right! I know some human mothers who could take lessons from Emma. The roosting order was thus: Emma and Joanne slept together on one side of the nesting boxes while Harriet and Billy Jo took the opposite side. All was at peace – at least for now. In my ignorance of safe houses all did not stay well! Look for Emma’s Dilemma’s 2 soon. Peace and love to all! This entry was posted in Emma's Dilemma's, Uncategorized, Wild and tame animal stories and tagged Chicken Behavior, Chicken Coops, Human Interest, pets, true stories, wild animals. Bookmark the permalink. My mother would claim you as hers if she were alive. Just the fact that you would consider writing about a chicken would endear you to her. She loved her chickens and would do the m no harm. However, we had a terrible storm one d ay and when it was over, we found all of the chicke ns smothered to death or dieing. Mother had to kill and cook them immediately because we needed the food, but she cried the whole time. I’m sorry to hear you were unwell but happy to hear you are starting to feel better. I missed your blog, your words, your art, your voice. What a lovely comment. Emma and I both thank you! I missed you too so much and am looking forward to catching up! Great to have you back on the blogosphere!! I am glad you are feeling much better now. Missed your paintings and your encouraging comments that always brought a smile to my face!! Emma and I both thank you so much and send love right back to you. A smile from you makes it all worthwhile! Your post are a joy because you show me what I cannot see myself and because of your awesome heart! I’m just so happy to see you back here… All these days I missed your presence in blogosphere. Sorry to hear that you were unwell. I hope everything’s fine now and you will feel better soon. May God grant you energy to create again. Take care. I have missed you too sweet Manu and it is so great to be back on the computer again connecting with all my good friends. Thank you for the good vibes! Oh, what a sweet and wonderful cousin you are! I agree with you on the coop and that did change. Well, that is what spell checks are for and Word Press has a good one. You would be a excellent writer and a wordpress blog is free: A good way to start a book! June, it’s so good to see you back on the blogosphere again. I’m sorry you were feeling low (an understatement right there!) for so long but I’m glad that things are starting to look up. In the mean time, take it easy and I’m sending you plenty of good wishes and positive energy your way! Thanks for the compliments and the visit. I hope that you get time to read the story of I Promised You. It has eleven chapters-so takes time.Just click on the link in the header or the drop down categories on the right and select The story of I Promised You. Then you need to scroll all the way to the bottom to start the story at the beginning. Word Press does it this way -who knows why. Emma’s Dilemma’s will also be written in chapters if you are interested. Thanks again! I sure have missed my friends like you and am so happy to be on the computer again. It will take me some time to catch up! God knows what I have missed!Thank you so much for the good wishes and positive energy. If anyone can sens them it would be you! yes, Emma is a “regal” chicken and very human like in her behavior. Strong too! I am glad that you are willing to read her story and so glad to see you here! Thank you, Hope that you like her even better as the story progresses. Hey there Allie! I just knew that you would stop by. I guess that we both have a lot of catching up to do . I missed your awesome blog and was just about visit when I got this comment . Great minds think alike! Ha Ha. I hope to keep chugging along here but no matter what it’s great to see you! And I will be catching up on all of your wonderful poetry . Sending love your way! And HAPPY BIRTHDAY TO YOU! Mine was the 14th .Bastille Day but we are about have a dinner now because my family is here now. I am SOOOOOOOOOOO Happy to be back sweetheart and I did miss you so much. I have a lot of catching up to but it is great to see you here again. Yes it has been a while and It’s good to see you again. I will be having fun catching up with your blog and others soon . Take care! Thank you sweetie. I am fine just busy painting. I will get back to the blog as soon as I can. It has been long since we last havea word. Hope you are okay. Miss you! !